I served the reunion meal uncharacteristically early this past Monday because my niece, Lee, happened to be home from college for the long Presidents’ Day weekend. 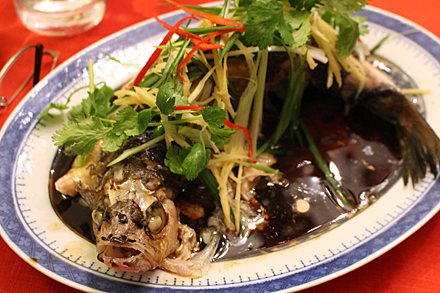 It was a special treat as we haven’t had her in the city to spend Chinese New Year with us for the last few years. 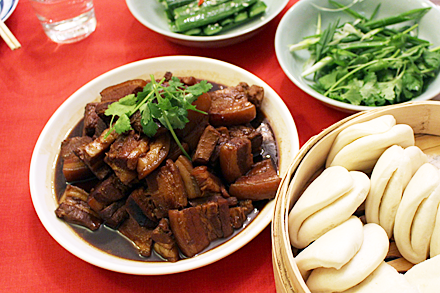 Having family together for the Chinese New Year is a joyous time and the Chinese mark the occasion with foods that symbolize happiness. 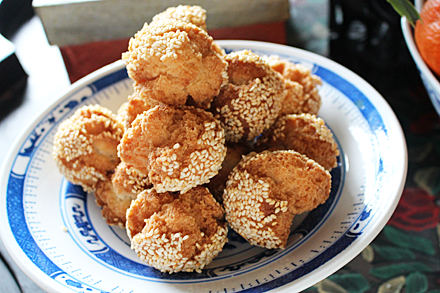 One of these is a Cantonese pastry known as “smiling sesame balls” (笑口棗). 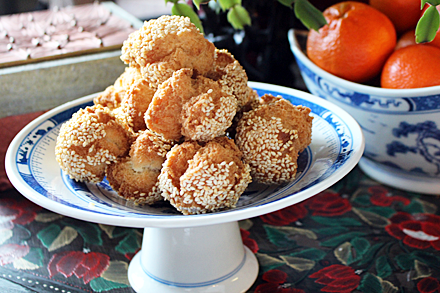 Made from a baking powder leavened dough, the balls crack open when deep-fried and resemble smiling faces. They are usually served as a snack before dinner. I’ve included a recipe for this delicious pastry at the end and hope you will enjoy it. 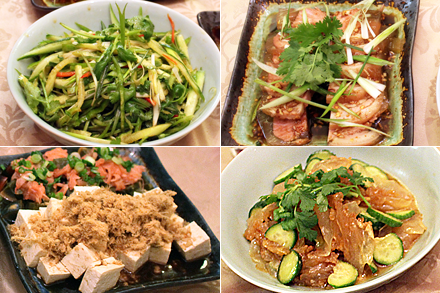 The ten-course banquet menu I planned included the standard red cooked pork and steamed fish along with roast duck and fish maw soup, which I prepare less often. 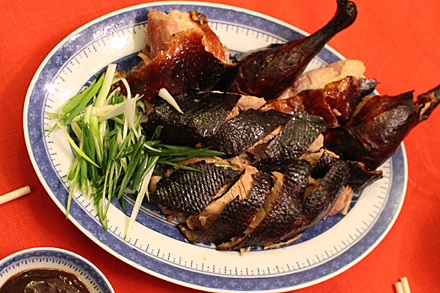 To ensure crisp skin on the duck I had to dry the duck in the refrigerator for three days. Not something I normally do to prep a meal, but the result was worth all the effort. 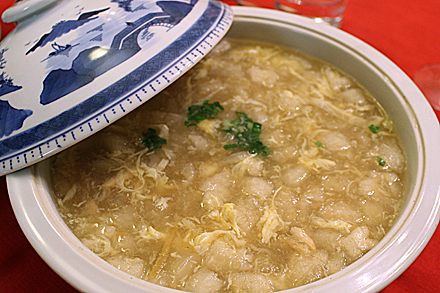 Fish maw, which is the swim bladder of a fish, is a rather luxurious food and is a favorite of the Fujian people. 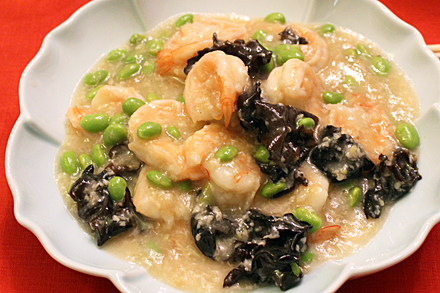 I remember how fish maw soup with crabmeat used to be a staple of all the banquets in Singapore where I grew up. 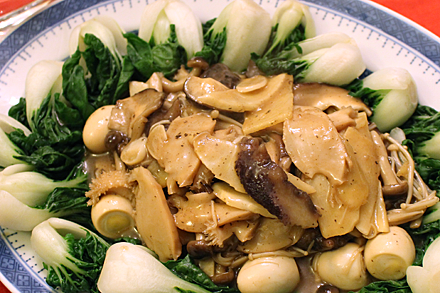 A stir-fry of shrimp with white wine lees, a clay pot of arrowhead and vegetables, and braised abalone and sea cucumber followed. 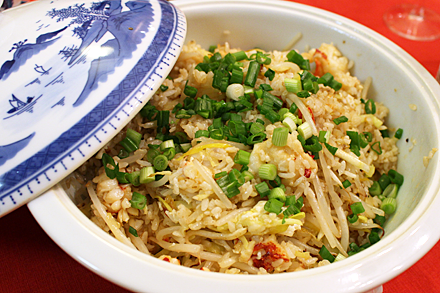 Lobster fried rice with yellow chives was the lavish finale of the savory portion of the meal. I made two desserts to conclude the feast. 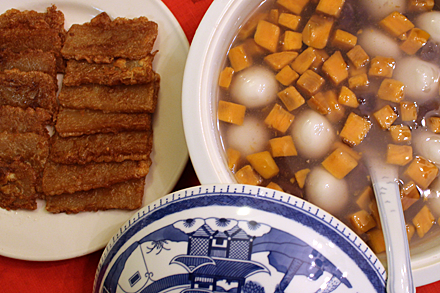 The New Year cake was simply battered and fried, and a sesame filled mocha ball soup was fortified with yam and taro. 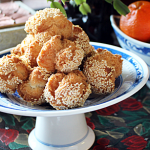 Finally, tangerines were offered to symbolize hoped-for prosperity in the New Year. This being the year of the sheep, I was tempted to cook a lamb dish. But given that many of my family members are not fond of lamb, I’m happy to say that no sheep were harmed in the preparation of this year’s holiday meal. 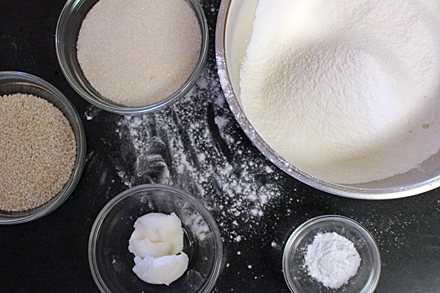 Combine and mix well both types of flour with the sugar and the baking powder in a mixing bowl. Add the beaten egg and water to the flour mixture and combine well. The dough should be soft but dry. If the flour does not form a dough add a few tablespoons of water. Let the dough rest for about 10 minutes. Put the sesame seeds in one shallow bowl and clean water in another. Pinch a small portion of the dough and form into a ball about ½ inch in diameter. Continue to make dough balls until all the dough is used. 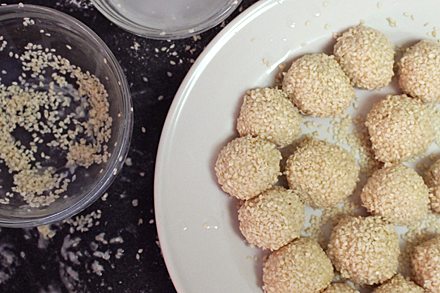 Pick up a dough ball and dip it in the water, then roll it in the sesame seeds to coat. Repeat for each dough ball. 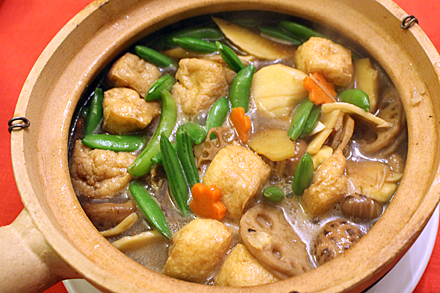 Heat the vegetable oil in a wok until it is just beginning to simmer, or the temperature reaches 350° F. Fry the dough balls in batches of ten over medium heat. Fry the dough for about 10 minutes or until the balls crack and are golden brown. Lower the heat slightly if the dough is browning too quickly. Remove the dough balls from the oil and drain them on a paper towel. 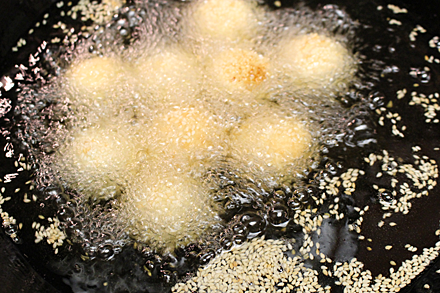 Repeat the frying process until all the dough balls are cooked. Congrats on the book! Can’t wait to hold it in my hands! Thanks Katherine for your kind words. I am looking forward for the book to be published as well.